The fifth Women’s Little Christmas Black Dress Ladies Lunch takes place on Sun 6th Jan 2019 in the beautiful setting of Kilronan Castle, Ballyfarnon, Co. Roscommon. North West Simon Community would greatly appreciate your support by joining us at this event. MC on the day will be RTE North West Correspondent Eileen Magnier. Before the Christmas festivities come to an end there is one last event that us girls like to celebrate, Women’s Little Christmas. Also known as Nollaig na mBan, Ireland is the only country in the world to celebrate the event and it’s very much a Munster tradition that has been enjoyed for generations. That doesn’t mean that ladies across the country can’t join in on the fun. 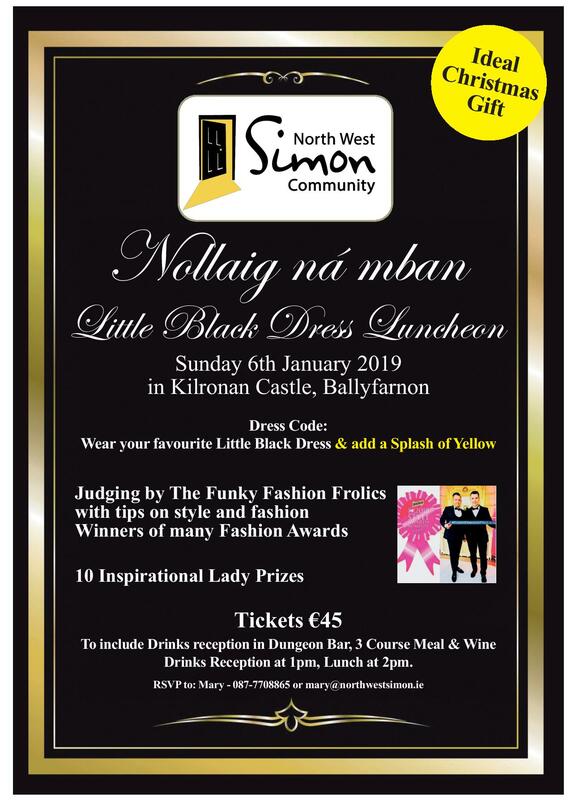 Mary Mc Keon, Development Officer with the North West Simon Community is organising the fifth Nollaig na mBan – Little Black Dress Luncheon for the North West Simon Community and this year ladies the event falls on Sun 6th. The event starts at 1pm with a complimentary pre dinner drink and canapes in the Dungeon Bar with a pianist, followed by a three course exquisite lunch at 2pm in the magnificent ballroom at Kilronan Castle. Guests will get a chance to browse around various stands after the meal. Dress code is black dress with a prize for the best splash of yellow (The Simon Community colours) just to make the event interesting! So ladies watch out for those yellow accessories!! Judging will be by Mike McCarthy and Paul Carroll who have an award winning blog on fashion, beauty, lifestyle and news worthy stories. Known as the Funky Fashion Frolics, they won best social media award at the Meath Style Awards in 2017 and 2018 where the duo also proudly won the overall in excellence in style award. They regularity MC at fashion events and promise to be a lot of fun. There are excellent prizes up for grabs in the raffle including 2 nights B & B plus an evening meal in Kilronan Castle (worth €400) plus a voucher for Lough Rynn Castle. All proceeds of this event are going to the North West Simon Community, the charity that works with individuals and families in the North West to prevent homelessness. Last year alone the charity prevented 180 from becoming homeless as most of the work is preventative. The feedback from last year’s event was extremely positive and this year’s event promises to be outstanding. The charity has seen a huge increase in the amount of families presenting for assistance and support and North West Simon Community cannot help these people without your support. Tickets are available from Mary Mc Keon on 087 7708865 or e mail mary@northwestsimon.ie and from reception at Kilronan Castle or the charity office at 4 JFK Parade in Sligo. Follow the charity on facebook (North West Simon Community) for updates. Tickets can be bought online through Eventbrite also. Tickets are an ideal Christmas Gift for any lady or a great office get together after Christmas as your post-Christmas office/work party when all the dust has settled!! Tables of 10 can be booked in advance. Tickets sell fast so enquire asap. Guests can avail of discounted room rates if required. If your business is interested in becoming a sponsor of the lunch, please contact Mary on 087 7708865. This will cover costs of the event and ensure the most money possible goes directly to North West Simon Community prevention services. Sponsors will receive recognition at the lunch and logos will be featured on each table, in the programme and on the charity website. The charity depends heavily on the success of these fundraising events through-out the year to provide support to people who are homeless or at risk of homelessness. Any donations of spot prizes are extremely welcome also. So ladies Save the Date and support local this Christmas. Ideal Christmas gift and helping a worthy cause.